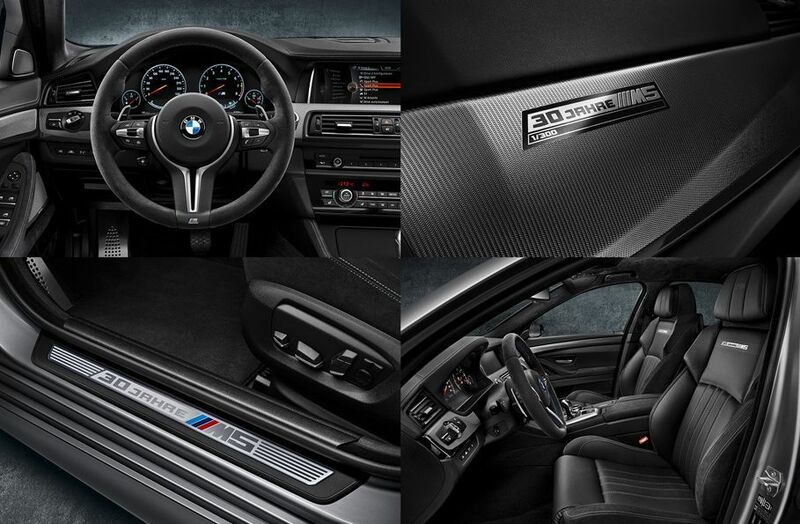 Last year charged sedan of BMW M5 celebrated the thirtieth anniversary. Bavarians decided to note event and prepared anniversary special version models. 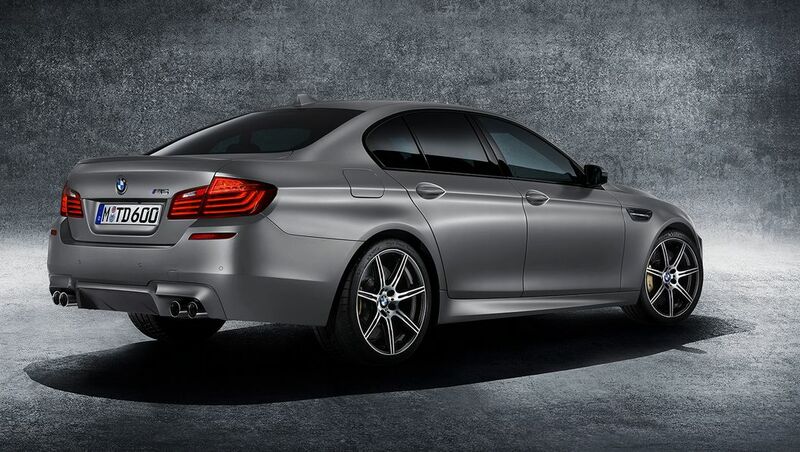 Unlike other similar editions M5 received not only external changes, but also the modified engine. 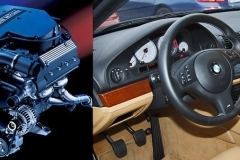 On this special version bi-turbo engine V8 4.4 instead of 560 develops 600 h.p. From zero to 100 km/h a car is accelerated in 3,9 seconds and that’s 0.3 seconds faster than standard version. The maximum speed is limited to 250 km/h. As an optional package M Driver is accessible, with increases maximum speed to 305 km/h. 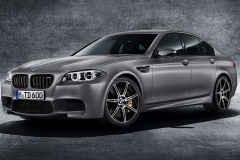 The sedan of BMW M5 gets nice design performed and made by 30 Jahre receives special body (Frozen Dark Silver), 20-inch wheels of new design, and also a chaser with the special edition slogan. By default the car goes with package Competition Package into which the suspender underestimated on 10 mm enters. 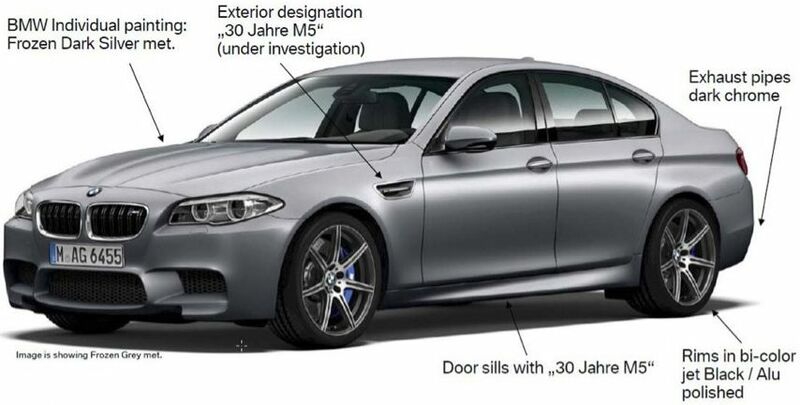 On the European market M5 should be released in the summer of 2014. 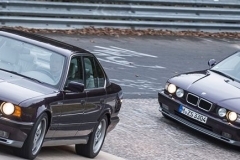 It is considered to be the beginning of history of the “charged” sedans of BMW M5 occurrence of model of BMW M535i in 1979 (index E12) on a showroom in Frankfurt. Certainly, it was not the high-grade M-car, but also completions from engineers of compartment M GmbH sufficed. 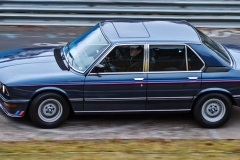 Modest enough by sight to a sedan sent atmospheric M30 — the six-cylinder motor a working volume of 3453 cm3 which was at that point in time put only on a sedan of the seventh series and a coupe of the sixth series. The engine equipped with electronic injection Bosch L-Jetronic, gave out 218 HP at 5200 rpm and 304 twisting moment at 4000 rpm. Pull-rod arrived on a rear axle with blocking through five-step “mechanics”, and acceleration to hundred in only 7,2 seconds. 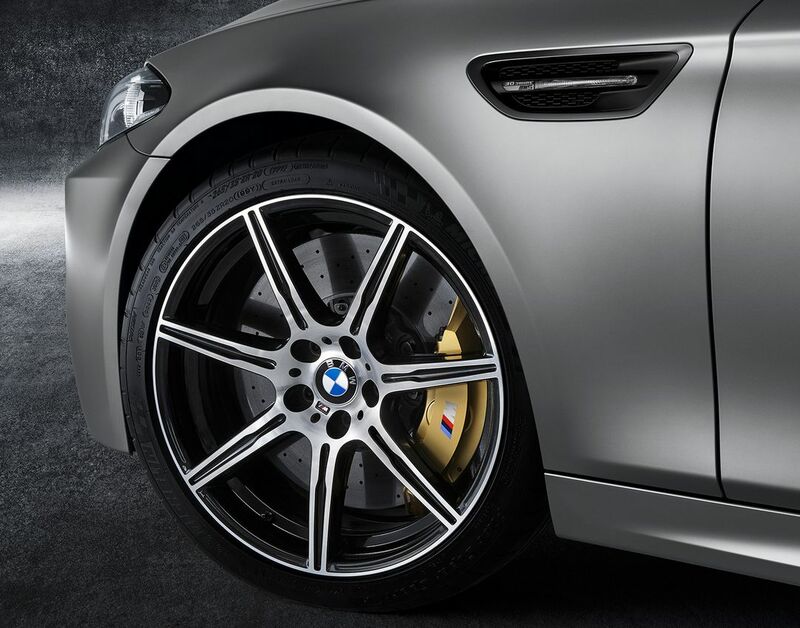 Version M535i differed from standard “colleagues” the re-customized springs and absorbers, but clasp brakes were same, as well as at others 5 series with motors I6. 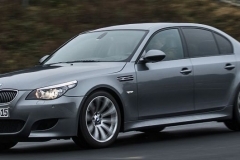 For Europe M535i E12 assembled at German factory of BMW Motorsport GmbH, but, for example, for the market of the Republic of South Africa cars assembled from prepared parts at the local enterprise. And version M535i removed to following generation of the fifth series — E28. 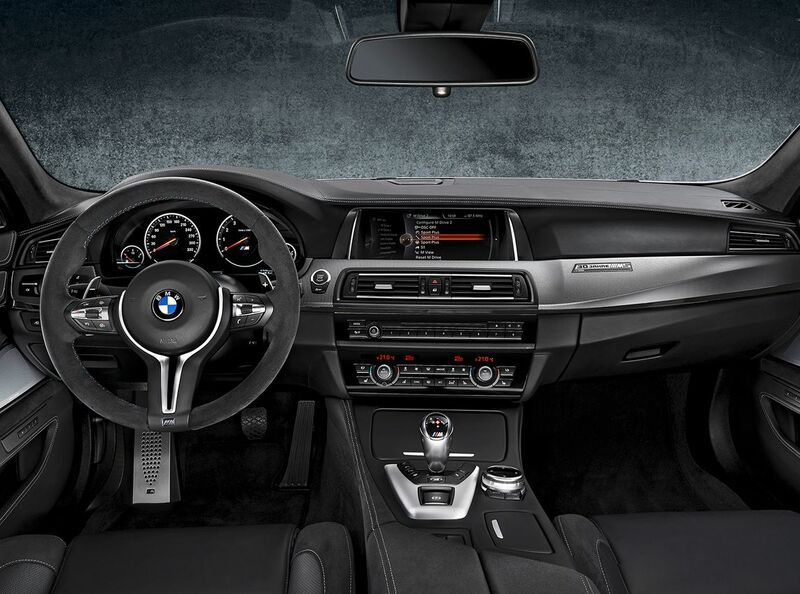 Sports in appearance became hardly more, but kickback of atmospheric “six” 3.4 made the same 218 “horses” and 304 Nm. The set occupied of 100 km/h 7,2 with, and the maximum speed reached almost 230 km/h. 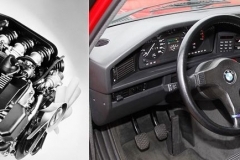 Besides five-step “mechanics” in a ruler of gear boxes appeared 4 gear automatic box ZF with three modes of behavior (sports, winter and manual). 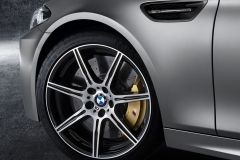 As well as on BMW M535i E12, the successor had the modernized absorbers Bilstein, the truncated springs and antiroll bars. Brake gears remained standard, but in equipment engaged ABS. 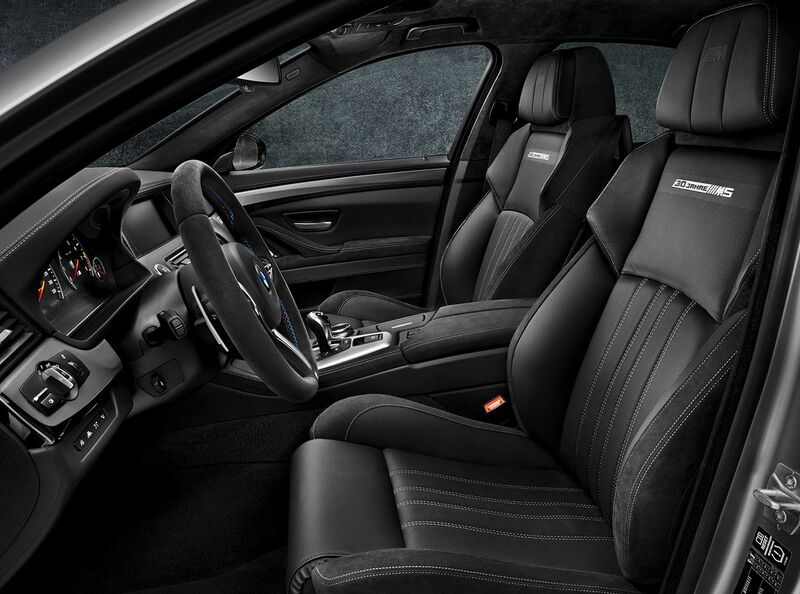 Sports armchairs located in an interior of cars in body E12 and in body E28 with an original proline. In total with 1984 for 1988 10 335 cars have been made. The first high-grade sedan of BMW M5 was issued in February, 1984. Then on a showroom in Amsterdam Germans showed “the charged” car of series E28. Under a body in length of 4620 mm and width 1699 mm disappeared six-cylinder motor M88/3 a working volume of 3,5 l (286 h.p. ), five-step “mechanics” and completely an independent suspension. The sedan in weight of 1550 kg could reach hundreds for 6,1 with and develop over 250 km/h. The interior differed details which could not be ignored. Initially inside established sports armchairs with the developed lateral support and a pillow with mobile section, but by request to the client could put less dense seats or, on the contrary, more rigidly, firms Recaro. 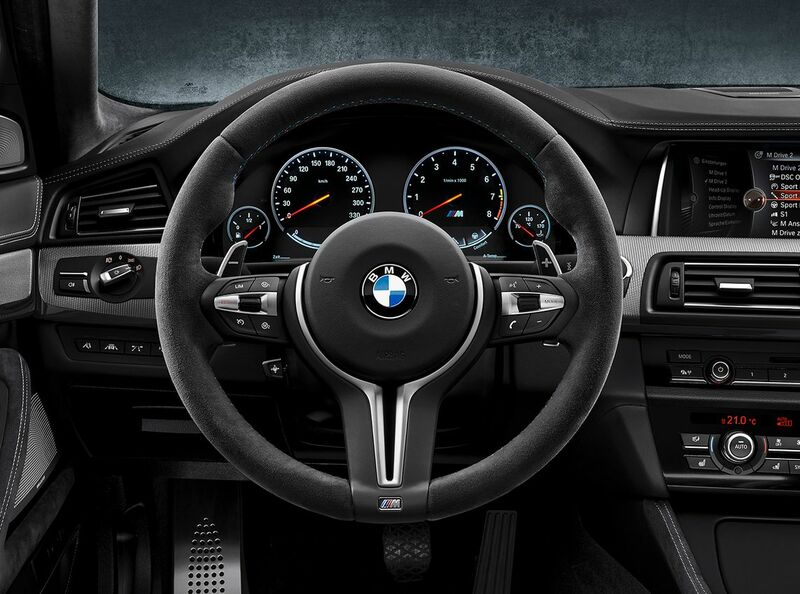 The M-wheel, an original shift lever, moldings on thresholds with logo M5 — to it M series differed from usual 5th generation cars. Till 1988 of all 2191 car has been made. In 1988 from the factory conveyor in Garhinge descended the first M5 second generation (series E34). On a photo — the car before restyling. Strict and moderately sports appearance captivates and to this day, and an interior even more reminding a cockpit and creating corresponding aura, did not distract the driver from driving. The first years the sedan with рядным the six-cylinder motor 3.6 and a five-step manual gear box was issued only. It from a nose to a tail had 4719 mm, and the equipped weight increased to 1670 kg. The petrol unit developed 315 forces and 360 Nm. In 1991 this “six” seriously modernized: the working volume added 200 “cubes”, and kickback jumped up to 340 “horses” and 400 Nm. Also last year of manufacture in pair to the updated motor it was possible to receive six-step “mechanics” from which 4 door it was accelerated to hundred in 6,3 seconds. 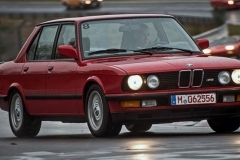 In 1992 among versions there was a BMW M5 Touring. By the way, Germans even experimented with M version of cabriolet, but further the concept car business is not went to serial manufacturing. Release by M of series E34 stopped in 1995. 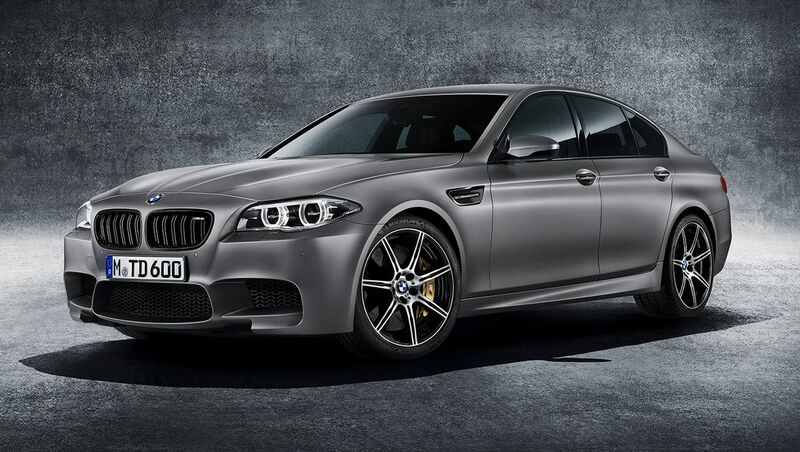 For seven years the world saw the 12 thousand M5 second generation. 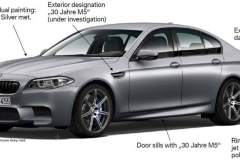 The following model of BMW M5 (E39) in scale of versions had again one sedan — the shown in a photo, was a concept model. The car was approximated, extended to 4781 mm and got more weight – already to 1795 kg. Whence it is so much fat? The increased dimensions, expanded more status equipment (look as the interior richly looks! ), but the main thing — the engine. “Six” sank into oblivion, and its place new atmospheric “eight” S62B50 occupied with a working volume of 4,9 l. The aluminum engine equipped with phase shifters Double-VANOS on an admission and release, gave out 400 forces and 500 Nm, worked in a tandem only with six-step КП Getrag and accelerated a sedan to 100 km/h in only 5,3 seconds. A suspender? In front — racks McPherson, behind — a multilever design. The leading rear axle has been equipped by differential with 25 percent degree of blocking. The car consuming in a commixed cycle of 13,9 l of gasoline on 100 km, was made at factory in Dingolfinge with 1998 for 2003, and the circulation made 20 000 cars. The debut M series of the fourth generation took place in 2005 then a sedan started to do at the enterprise in Dingolfinge. Thanks to Chris Bengla’s diligence M to look became much brighter, is more womanly. That you will not tell about interior — it became cold, unapproachable, even the central extension housing turned away from the driver. The length of a body increased to 4855 mm, width — to 1846. To 1855 kg the equipped weight increased. But also mechanics tried wonderfully well — instead of “eight” 4.9 under a cowl was drew high pressure atmospheric motor V10 5.0. 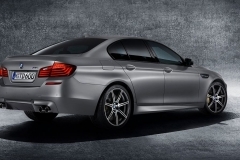 This engine was developed from zero specially for BMW M5. In “a ten” active there were 507 HPs at 7750 rpm and 520 Nm at 6100 rpm. The twisting moment on rear wheels moved through automatic gear box SMG III with seven drives (firm Getrag working out), which them for 65 ms. Ejection to hundred only took 4,7 seconds, and the maximum speed has been limited at level of 250 km/h. Also do not forget about completely disconnected system of the stabilization, the self-blocked differential on a rear axle and absorbers EDC with electromagnetic valves. In 2010 the car descended from the conveyor. For five years 19 522 sedans and 1025 luxury coupe models have been made.